We had heavy rains and high winds all day yesterday, which obviously wreaked havoc on our internet, as I was without a computer all. day. long. Our weather was finally decent enough, for an hour or so yesterday evening, that I could scope out the property and see what the storms had left behind. After a foot of snow, heavy rains, gale force winds, and 2 degree F temps I was honestly afraid of what I would find. It's been a heck of a week! Fortunately, I had no trees come down on my property, although a large one came down right up the road. 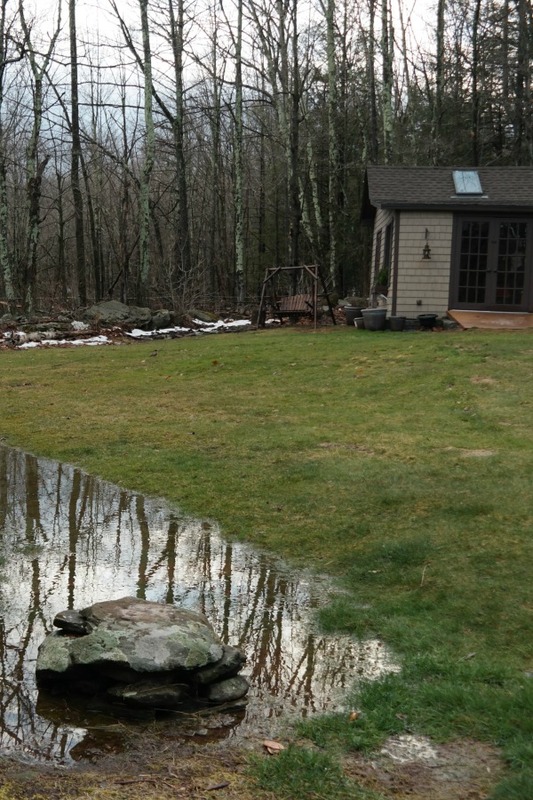 I had flooding in the usual spot in the back garden, right around the well. I haven't checked this morning, but it's probably a little ice rink now. 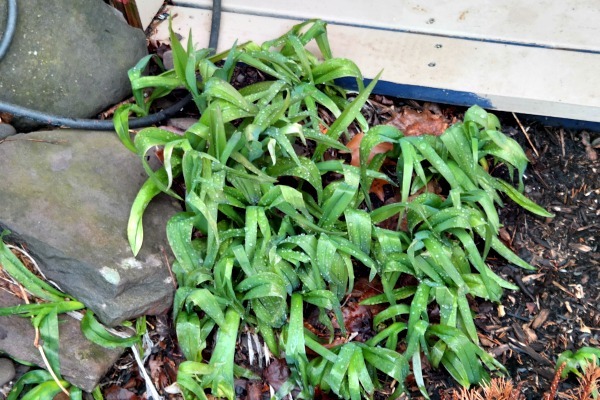 The patch of Tiger Lilies by the lower deck look a little worse for wear. Lilies are so resilient I have no doubt they'll bounce back in a few days. As for the Delphiniums that were so happy just a few days ago? I'm not so sure. The Daffodils by the garden steps are also looking a little bedraggled. And they were just swelling out with blooms....let's hope the blooms will rebound once the weather warms up. 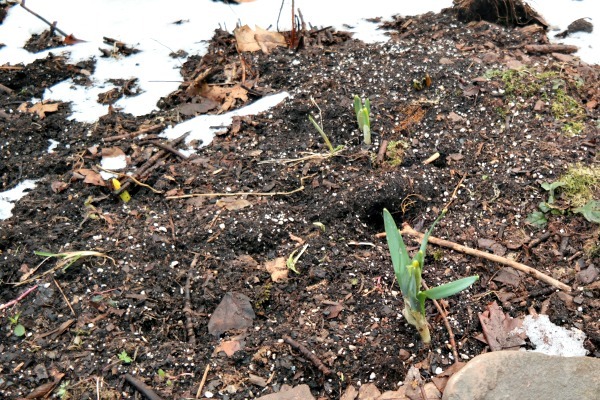 In the new garden bed I created last week the Daffodils I unearthed not only survived quite nicely but I found a third one popping up! That tells me that it probably was me that planted these, as this is my planting pattern for Daffodils....although I have no recollection of it! Either way, I'm happy! I am very, very worried about all my Lilacs. They all had such happy, healthy buds on them before the big freeze....and I think I was going to get lots of flowers this year, unlike last year. 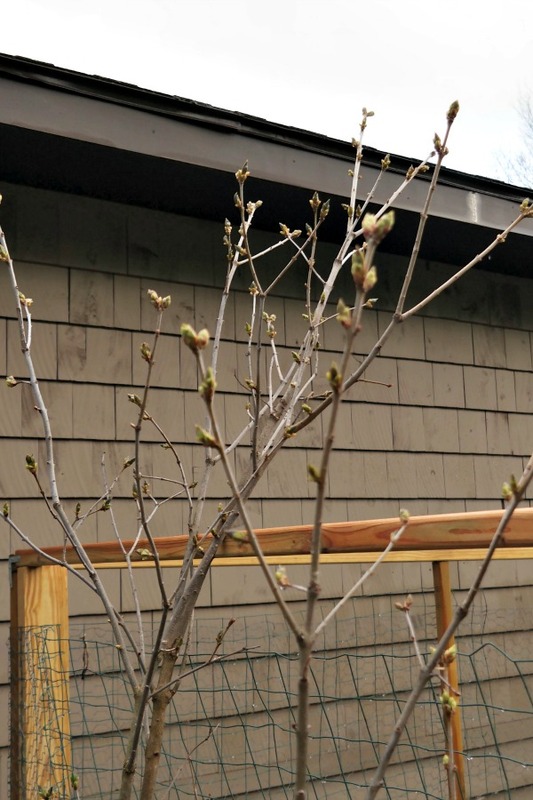 However, they don't look so happy or healthy now - I'm concerned all these buds are going to fall off and we'll just get leaves and no flowers this spring. Sad....I adore Lilacs! The Chives in the veggie garden, on the other hand, don't look like they suffered at all. They are such strong little plants! I am going to move my herb garden up to the deck, right outside the kitchen door, this year. I ordered some large wooden planter boxes that will serve the purpose rather nicely, I think. This will free up a lot more space for actual veggies in the veggie garden, as last summer the entire middle section here was herbs and nasturtiums. 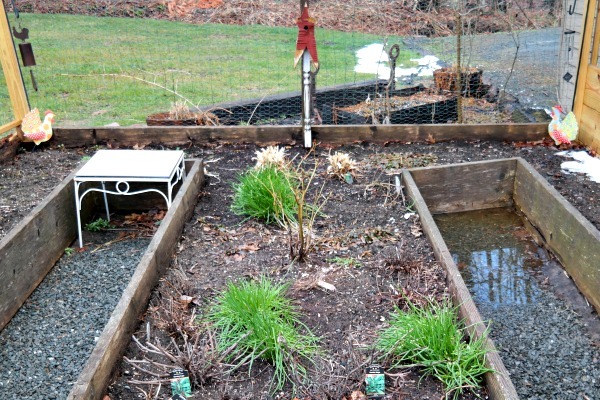 It looked wonderful, and the herbs did quite well, but the perennial herbs don't come back here anyway, it seems. 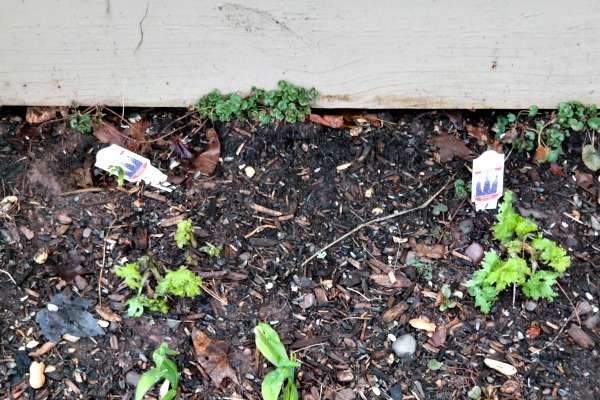 It's tough to get them to come back year after year in a raised bed in our region...except for the chives, of course. The herb garden may as well be outside the kitchen door in that case - it just makes more sense. I'm also quite concerned about the mystery Roses on the obelisks by the garden steps. The largest one was already leafing out....I'm thinking those leaves are not going to be one bit happy with this winter weather that was thrown at them! I'm very lucky to live on a piece of property that has such a strong water component....not only does it soothe me to no end to hear the water flowing all around me, but it also means my artisan well is constantly refilling. That's incredibly valuable when your only source of water is an artisan well....and you have three women showering daily, doing laundry regularly, etc. 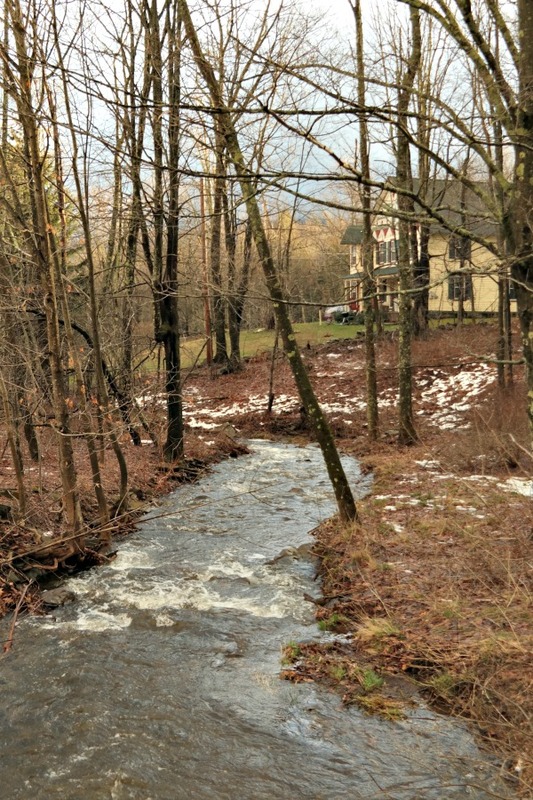 Needless to say, after all that rain and snow melt, my little creek was happily flowing along at the edge of my property, singing it's happy tune. All the inlets that tumble down through the woods to meet the creek were also making the most lovely sound. It won't be long until we hear the lovely little peeper frogs join in with their harmony. I can't wait - that's one of my favorite sounds, and lulls me into such a peaceful place on a warm summer evening. The skies were getting mean looking and it was time to make my way indoors, back to my warm fire and some supper. 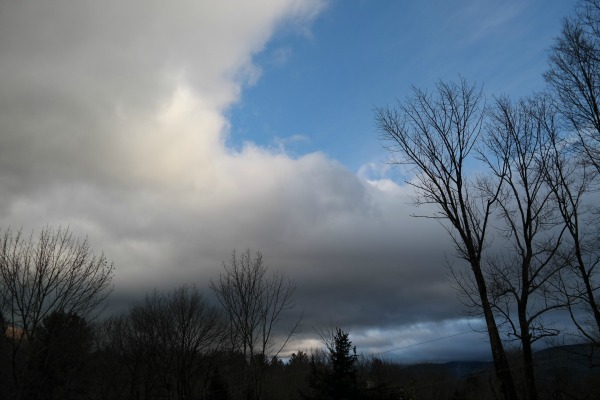 We were in for another batch of rain and snow showers overnight....and the cold temps and snow will be sticking around until Wednesday, it seems. But after that, things look much improved! I should be able to take the pansies back out of the garage and let them enjoy spring out on the patio, like they should. 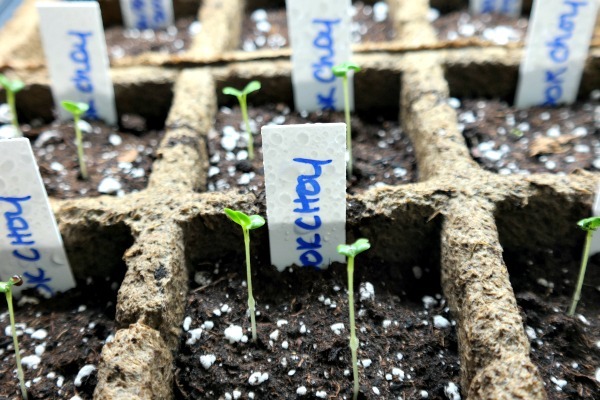 Meanwhile, back indoors, the new batch of seeds are sending up sprouts already - the Bok Choy was the first to emerge, followed by the Marigolds and Zinnias. This morning I see the Sunflowers peeking up as well as some of the Tomatoes. Exciting times in my little seed starting world, downstairs! It's what's keeping me sane while I wait for spring to return to the mountain top. No matter the season, it is so beautiful there! I see why it is so peaceful for you...I feel peaceful just seeing your photos! Awww, thanks so much, Linda - I never get tired of the beauty around me! Were your lilacs ok, Susie? Have they bloomed yet? That's super sweet, Debbie, thanks so much!! :) My Mountain Sister....that's you! I'm thinking of planting some herbs too. I tried a patio garden last year with some herbs and even potted some tomatoes but the birds eat them all in a day! Any suggestions on that? Wow, really? Were you planting cherry tomatoes? You might have to use some netting to keep the birds off your plants - I've never had a problem with birds eating my tomatoes....but I have had a problem with either squirrels or chipmunks grabbing big tomatoes right off the vine when they are just about ripe and eating them right there in the garden! Good thing there's enough to share....the little buggers! Praying that your roses and lilacs are not damaged. We have had years when our fruit frees have budded or bloomed and then a heavy freeze sets in killing off all the fruit buds. I'm sitting here looking at my cherry tree in bloom and praying that does not happen this year as well. Apparently the apple growers in NY are quite worried that they may not have any apples this year - could you imagine? 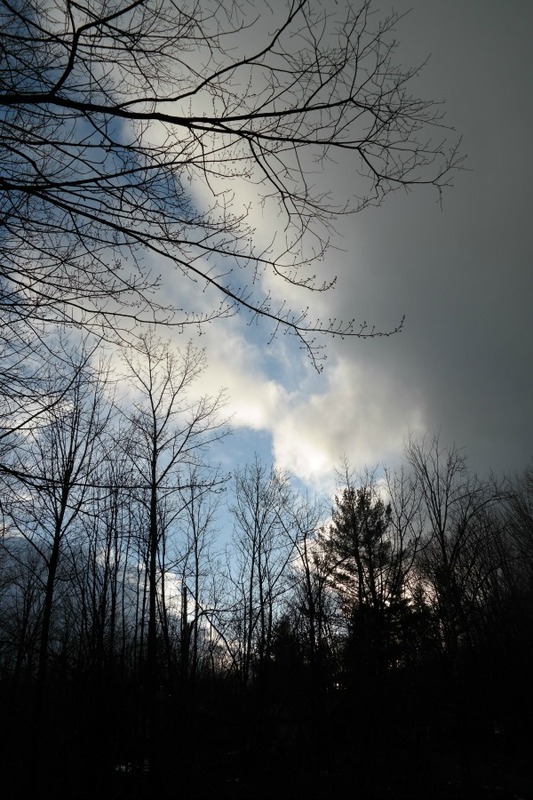 I know you're anxious for spring ... to stick around. Hopefully not all was lost with your plants and such. It's amazing how resilient nature can be. Let's hope, Dayle - let's hope. 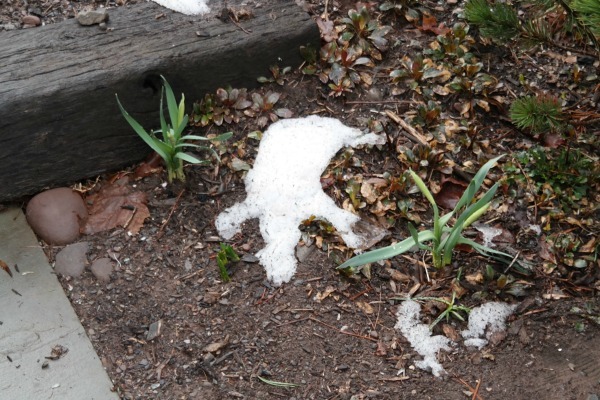 Do you think you'll get more snow before you can actually declare it springtime there? Herbs on the deck will help keep bugs at bay. Yes, I think we will get more snow....but hopefully not as much as last weekend. I think we may be down to flurries and dustings at this point....not inches and feet. Cold tonight again and then warming up - yayyyyyyyy!! We are getting the same crazy weather and it snowed lightly all day today. We are told warmer temps by Sunday. 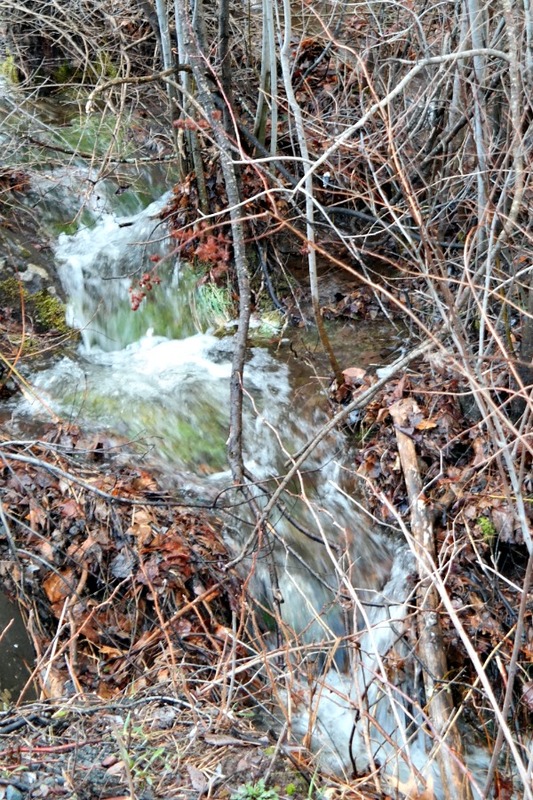 I love that you have a little creek running through your property. There is a world all it's own there. So fascinating. Your neighbours home is very pretty, too. Same here....I might be able to take the pansies out of the garage again on Sunday - I'm watching a couple of night temps to see....but it's looking promising! 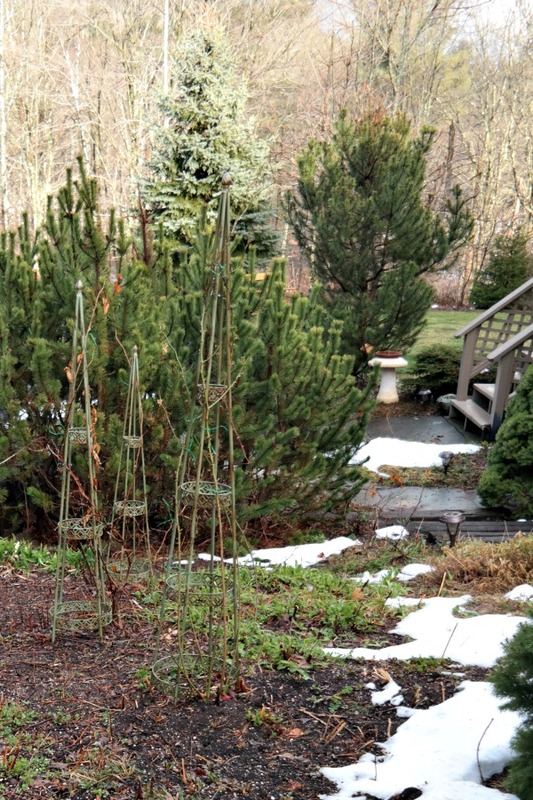 Your yard is truly coming to life! Have a wonderful weekend. It's trying, Laura.....trying really hard! Soon....just not soon enough, it seems! Winter is lasting quite awhile for you an others this year. I hope your weather warms up after this next batch of winter weather. I know you are chomping at the bit to get outside. I am beyond chomping, Lorraine, I've got ants in my pants!! After all the bad weather, you deserve a perfect summer! 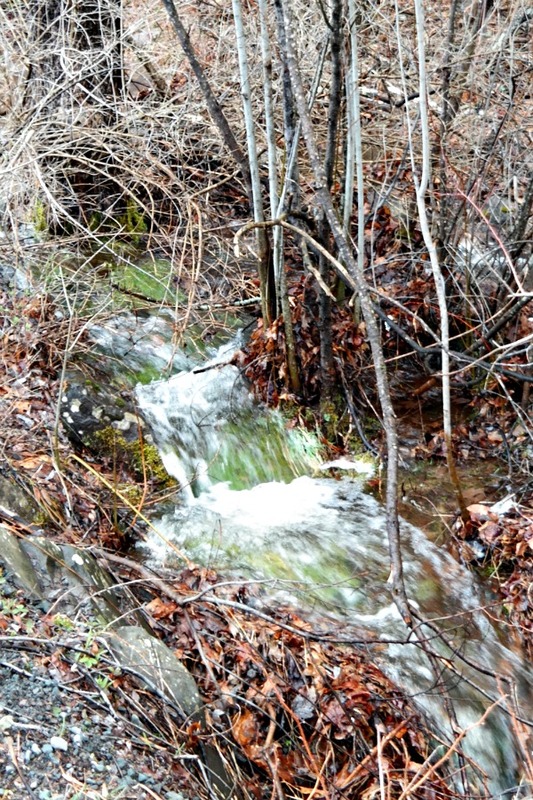 Your mountain retreat is just gorgeous...love the stream! I love the sound of the stream in the evenings, Donna - it's just so peaceful! In my other homes I always added a water feature....now I don't have to! Can you believe all the bad weather...everywhere!! Your place is beautiful. I love the flowing water. Hope all your plants come back and bloom pretty. What is this world coming to with all this terrible weather? Chives are amazing! They look well despite the cold. They do well here too. One of mine has sprung the prettiest bloom, but it has lasted a year. Pretty creek nearby too. How bizarre - the flower lasted a year? That's amazing! Yes, chives are definitely a stalwart in the garden - I will be moving them up to the deck so I use them even more often when cooking.